Drivers and Fans Use Promo Code to Receive 5% off SimVibe Software! 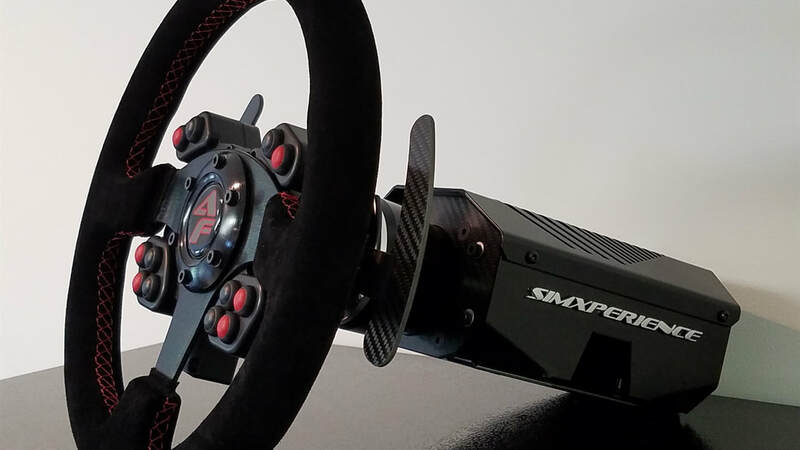 The SimXperience AccuForce Pro V2 "Complete" is a professional racing simulation steering system. When combined with todays best racing simulation games, the AccuForce Pro is as close as you can get to driving the real thing and is delivered in a convenient, ready to run, plug-n-play package. The key to it's incredible realism is our groundbreaking direct drive motor control system. We've engineered an integrated motor controller / PC interface as opposed to communicating between two different circuit boards as is common in the industry. This allows the AccuForce to provide lower latency, better response and more accurate detail reproduction than competing direct drive systems. Combined with a motor that's specifically designed for racing simulation, the AccuForce system provides the best possible balance of torque, response and most importantly, fidelity and linearity. The end result: a driving experience that's second only to the real thing. User selectable modes (similar to those on a stereo) allow easy selection of linear performance, peak performance, soft performance, child mode, etc. 4500 degrees of rotation, configured for 900 degrees by default. User may opt to alter this setting in real-time. Coiled cable limit is 1080 degrees. * - Measurement taken with digital torque wrench at motor stall. Torque wrench manufacturer stated margin of error is +-5%. When designing mounting systems and evaluating safety concerns, please design for a 16Nm peak servo torque scenario. SimXperience AccuForce Pro V2 Base Unit with 6ft (2m) cable. The AccuForce Pro V2 "Complete" is a fully assembled, ready to run kit.